I have had many infirmities which you have been obliged to bear with, and what is more, all I have done has been worth nothing…I have willed what is good, that my vices have always displeased me, and that the root of the fear of God has been in my heart; and you may say that the disposition was good; and I pray you, that the evil be forgiven me, and if there was any good, that you conform yourselves to it and make it an example. These dying words are of a repentant sinner saved by God’s good grace, that was called by God to imperfectly, but faithfully and sincerely to fulfill God’s call upon his life as pastor and leader. What a exemplary and humble legacy he leaves for all of God’s servants, to recognize the good that one has done in sincerity and fear of the Lord, but at the same time to be fully aware of the need of a Savior until we shall see Him face to face! (1 Jo. 3:1-3). Who, indeed, is sufficient for these things of ministry?! Apart from Christ we can do nothing; in Him, we can do all things! (John 15:1-5; 2 Cor. 2:16b; Phil. 4:13). John Calvin was born as a man of the church, a covenant child reared within the medieval Roman Catholic church in France. He was a brilliant young scholar known for his “quick intelligence and excellent memory” who by God’s grace and good providence was granted the opportunity of an ideal education. In fact, throughout his young life, Calvin received the best education that one could receive in France at that time. He studied the humanities, law, philosophy and theology, and was knowledgeable and able in all of these subjects. He studied at the most prestigious universities in France: Orleans, Bourges, and Paris from 1528 to 1533. Calvin had the opportunity to profit intellectually from some of the most notable professors in France and Europe at that time. He studied first for the priesthood, then under the influence of his father, he was the dutiful son who studied law for a time at his father’s direction.. Yet though the young Calvin was full of knowledge, he didn’t possess that most important wisdom and knowledge: true knowledge of God and of himself revealed by the Holy Spirit in regeneration through the Holy Scriptures. Until around ca. 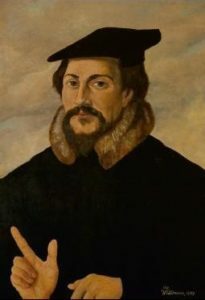 1533, when Calvin was in his early twenties, he was suddenly converted to the Lordship of Jesus Christ, and to the truths of biblical Christianity. The influence of the Reformation from Switzerland (through the influence of Ulrich Zwingli) and Germany (through the influence of Martin Luther) were taking hold in places in France and the ideas of the reformation were being discussed at the universities he had attended. When I was as yet a very little boy, my father had destined me for the study of theology. But afterwards, when he considered that the legal profession commonly raised those who followed it to wealth, this prospect induced him suddenly to change his purpose. Thus it came to pass, that I was withdrawn from the study of philosophy, and was put to the study of the law. To this pursuit I endeavored faithfully to apply myself, in obedience to the will of my father; but God, by the sweet guidance of his providence, at length gave a different direction to my course. And first, since I was to obstinately devoted to the superstitions of Popery to be easily extricated from so profound an abyss of mire, God by a sudden conversion subdued and brought my mind to a teachable frame, which was more hardened in such matters than might have been expected from one at my early period of life. Having thus received some taste and knowledge of true godliness, I was immediately inflamed with so intense a desire to make progress therein, that although I did not altogether leave off my [humanist] studies, I yet pursued them with less ardour. I was quite surprised to find that before a year had elapsed, all who had any desire after purer doctrine were continually coming to me to learn, although I myself was as yet but a mere novice and tyro [beginner]. Being of a disposition somewhat unpolished and bashful, which led me always to love the shade and retirement, I then began to seek some secluded corner where I might be withdrawn from the public view; but so far from being able to accomplish the object of my desire, all my retreats were like public schools. In short, whilst my one great object was to live in seclusion without being known, God so led me about through different turnings and changes, that he never permitted me to rest in any place, until, in spite of my natural disposition, he brought me forth to public notice (Calvin, Commentary on the Psalms, Vol. 1, preface, xl-xli). “For you formed my inward parts; you knitted me together in my mother’s womb. 14 I praise you, for I am fearfully and wonderfully made. Wonderful are your works; my soul knows it very well. 15 My frame was not hidden from you, when I was being made in secret, intricately woven in the depths of the earth. 16 Your eyes saw my unformed substance; in your book were written, every one of them, the days that were formed for me, when as yet there were none of them” (ESV Psalm 139:13-16). A significant event happened for Calvin that is similar to Luther’s nailing of his Ninety-Five Theses at Wittenberg. On October 10th, 1533, a friend of Calvin’s, a man named Nicolas Cop had been elected rector of the University of Paris. As was the common practice, Cop was called to delivery the inauguration sermon on All Saints Day, November 1st. The sermon was from the Gospel of Matthew 5:3: “Blessed are the poor in spirit” and most scholars believe Calvin had a hand in writing this sermon for his friend. What was memorable about this sermon, other than it was perhaps one of the first sermons John Calvin penned, was that it specifically aimed critically at the abuses of Medieval Roman Catholicism and the unbiblical doctrines taught by the Romish Scholastic Theologians who taught at the university. In the sermon, Calvin had written, and Cop read for all to hear: “They [the Scholastic teachers] teach nothing of faith, nothing of the love of God, nothing of the remission of sins, nothing of grace, nothing of justification; or if they do so, they pervert and undermine it all by their laws and sophistries. I beg you, who are present, not to tolerate nay longer these heresies and abuses”– -and the war upon Roman Catholicism was declared. Note the primary concerns of the reformers then, and still today in this brief quotation: The importance of faith alone receiving by grace alone the love of God through the justifying grace of Christ’s work for sinners, to bring about repentance and the forgiveness of sins. After he became a convinced and convicted reformer of Christ’s Church, Calvin became an exile from his home in France because of the persecutions occurring there, and thus experienced the first challenges of what it meant to be a persecuted Christian pilgrim for the Gospel, bearing his cross in daily service to his Lord. During these years 1533-1536, as a young convert to the Reformation, Calvin wandered as a faithful evangelist of the biblical gospel of Christ, and officially renounced his devotedness to the Roman Church. Calvin was becoming a renowned and respected evangelist-preacher in Southern France, Switzerland, and Italy. In 1536, John Calvin would be elected pastor and teacher of theology at Geneva by the elders and the council and with the consent of the whole people. And the world would never be the same by God’s good grace and providence. It was during this time, he desired to write the first edition of a handbook on Christianity to defend the true reformed faith, to humbly plead on behalf of the persecuted Christians in France, and to especially help Christians who had come to understand the true gospel so that they could read, interpret, and understand their bibles. This book became a runaway bestseller and publishing sensation immediately, and made Calvin a famous pastor and theologian. This book was entitled simply ‘The Institutes in the Christian Religion”. Calvin, John. Institutes of the Christian Religion (1541, Calvin’s Own Essentials Edition). Calhoun, David B. Knowing God and Ourselves: Reading Calvin’s Institutes Devotionally. Godfrey, W. Robert. John Calvin: Pilgrim and Pastor. Gordon, Bruce. John Calvin’s Institutes of the Christian Religion: A Biography. Hall, David W. and Lillback, Peter A. A Theological Guide to Calvin’s Institutes: Essays and Analysis (Calvin 500 Series). Lane, Anthony N. S. A Reader’s Guide to Calvin’s Institutes. McKee, Elsie Anne, ed. John Calvin: Writings on Pastoral Piety (Classics of Western Spirituality). Selderhuis, Herman J. John Calvin: A Pilgrim’s Life. ________. Calvin’s Theology of the Psalms.